Customer data is an invaluable asset to your business – one that you want to effectively manage, store and protect. Leveraging the ability to retain session replay and raw data of your customer sessions over an extended period of time allows you to not only perform additional analysis of customer interactions with your business, but it provides you the means to efficiently tap into data you can use to resolve customer disputes, help identify fraud and comply with regulatory audits. 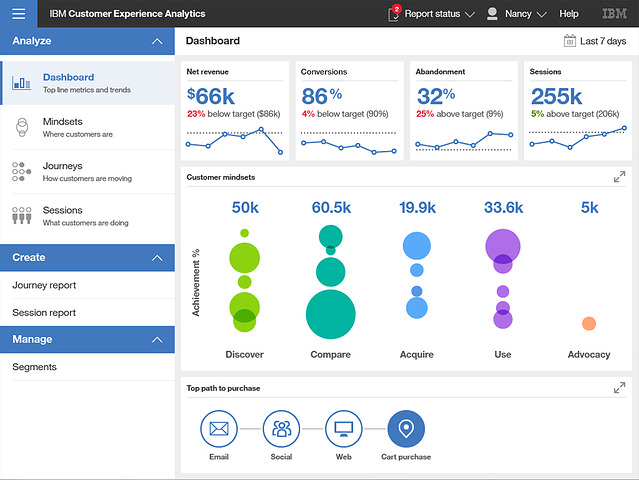 Watson Customer Experience Analytics (CXA) provides a unique means to collect vast amounts of CX data, then segment the data to understand customer experience issues. Now Watson CXA also provides the means to retain and manipulate the data in new ways to provide additional use cases to maximize the value of collecting and maintaining CX data. The new Session Data Export and Retention capabilities recently introduced in Watson CXA offer you increased ease and flexibility in managing your data, while providing for longer retention. Let’s take a closer look at the substantial business value that these new capabilities can offer. User interaction data provides unique information about how your customers engage with your organization through your mobile application or website. The ability to retain and manipulate that data, while looking for user experience patterns, is an extremely valuable asset for your business. For example, with the new Session Data Export and Retention capabilities, you can selectively export raw behavior analytics data in CSV format and then integrate this exported data with additional enterprise business solutions to expand on your data analysis and testing. This ability to combine analytic competencies can empower you with valuable business insight into cross-channel effectiveness and marketing campaign performance you can use to fine-tune your marketing and sales efforts, as well as offer a view into potential fraud detection that you can use to actively protect your organization. At the same time, the Session Data Export and Retention capability allows you to export and archive complete, replayable sessions in PDF format for long-term storage that you can use, as necessary, to resolve various business issues that may arise or to comply with regulatory requirements. 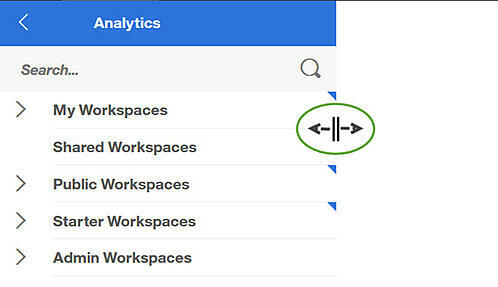 For instance, you can easily retain pertinent sessions by setting filters for exporting data, such as filtering by a "purchase" event or by a customized event for a "promo code,” to archive and replay the sessions at a later date to resolve customer disputes. The exported sessions for a purchase event or a promo code event, as examples, can be used as a record for the returning customer in case that customer disputes the 30-day return policy or challenges a promotional offering, allowing you to control costs and maintain your business’ integrity. In addition, archived and replayable sessions can act as long-term records for corporate or government audits and investigations of security violations or fraud, assisting you in preserving and safe-guarding your business interests. While the benefit of retaining and archiving your important data offers critical value to your business, Session Data Export and Retention also provides substantial financial advantages. The increased flexibility the solution provides in managing and storing your data means that you can enjoy the cost benefits of a SaaS offering and export your data for storage in a pay-as-you-go cloud storage model or in your own data center. Additionally, the ability to easily filter data helps you save and retain only what you need and find exactly what you are looking for. Whether you are currently a Watson CXA customer, an IBM Tealeaf customer or just getting started with digital customer experience analytics, build a plan to leverage the value of the user interaction data from your web and mobile properties. If you would like assistance with helping your company take advantage of IBM Watson Customer Experience Analytics, request a consult by clicking here. If you would like to review more use cases for Watson CXA then click on the tile below and request the ebook. To learn about how one company has successfully leveraged Watson CXA to reduce customer struggle and optimize their customers’ digital experiences, visit the IBM case study for Shubert Ticketing by clicking on the tile below. Improving Conversion Rates. It's about the DATA! The importance of optimizing web and mobile digital experience is well understood. There is lots of market data to support what is intuitively obvious. The challenge is in how to do it well. Do you have the tools and DATA you need to properly understand and manage the user experience on your web and mobile properties? Building and maintaining transactional sites that deliver great customer experiences is not easy. There are many permutations and variables that occur a high volume transactional site every day: device types, network, mobile, user path, country/geography, product selection, configuration choices, promotions/rebates, support, etc. Each of these variables can create different responses that alter the user experience. Testing is critical, but not flawless. Having the ability to collect the DATA that enables you to segment and slice user sessions by all these variables and then monitor user experience for each segment is critical for companies that are serious about managing online customer experience. None of the pure web analytic tools in the marketplace give you this level of DATA. There are a proliferation of tools in the marketplace that give you a variety of different views of customer experience, including heatmaps, link analytics, session replay (usually sample data), and A/B testing. Almost all of them fail to give you the level of DATA you need to segment and subsegment user sessions to monitor user sessions and identify issues or customer struggle points. Getting the tools and DATA in place is the first step to understanding, analyzing, and managing customer experience. Once you have the DATA then you can establish a set of business processes that will enable you to monitor customer experience. Linking customer experience analytic DATA to other sources, such as Voice of Customer, surveys, and the contact center will enable you to connect the dots between customer feedback and actual user experience. The right DATA strategy will also enable you to quantify the business impact of various user experience issues and prioritize those issues that are having the greatest impact to conversion and/or adoption rates. To get more information on best practices, click below to download the IBM Commerce whitepaper titled: "Five Ways to Increase Conversion and Adoption Rates". Customer experience management will improve conversion rates and ultimately boost revenue. It will also improve customer loyalty and social sentiment. The first step on this journey is to put the right tools in place, so you can collect the DATA you need. As a Tealeaf analyst, you will be building events and reports that enable a deeper understanding of user sessions and then assisting in the analysis of those sessions to identify customer struggle points. You will also work with the client to cross reference Tealeaf with their web analytic, a/b testing, and voice of the customer data. We need an individual who is passionate about analyzing data and uncovering insights as well as customer service delivery. We are looking for an individual interested in developing advanced digital, customer experience and business analytic skills. Pereion Solutions is a small entreprenuerial environment looking for people committed to client service and developing deep skills in digital customer analytics and the associated technologies. We provide a flexible and competitive work environment for employees that share our values. We are committed to skill development for our employees, outstanding customer service for our clients, and being the very best in the niches we choose to serve. You can read more about both positions at www.pereion.com/careers . If either of these roles and the environment I have described sounds exciting to you, we would love to hear from you. Just send an email with your resume to slperry@pereion.com. At the IBM Amplify Conference in Tampa this past week, IBM announced a new cloud based Customer Experience Analytic solution. This new offering combines the latest release of IBM Digital Analytics, Tealeaf CX on Cloud, and new Journey Analytic capabilities all integrated with UBX. This provides a unique set of capabilities which provide a complete view of customer interaction on your web and mobile properties combined with the ability to visualize the customer's journey over multiple sessions. For companies, looking to optimize customer experience and make decisions based on detailed customer data this new offering provides tremendous benefits. Let's take a closer look at what is included. This solution includes Tealeaf CX on Cloud, the SaaS based version of Tealeaf providing a detailed view of each user session combined with the ability to segment those sessions based on user events. Tealeaf is the leading CX solution in the marketplace in terms of providing the tools needed to capture and identify customer struggle. 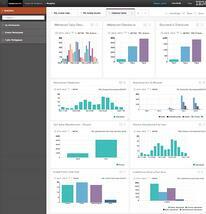 The new Digital Analytic solution combines a completely refreshed user interface with a modern Hadoop data structure. By integrating through UBX, with Digital Analytics and other data sources the rich data set from Tealeaf can be combined to provide extensive insight into customer experience and actions. The Universal Behaviour Exchange was released by IBM into market last year, it provides a bus to exchange user data between the different components (aka endpoints). This enables the exchange of data between the components I have already referenced, but also opens up to a marketplace of other marketing technology solutions that provide additonal insight into the customer experience and journey. UBX includes identity services to facilitate the mapping of different sessions to a single user. Moving from single session analytics to multi-session and multi-device views of a customer journey is something all marketers strive for, yet there are several inhibitors in getting there. By leveraging a common integrating bus with identity services we can start to break down those barriers. 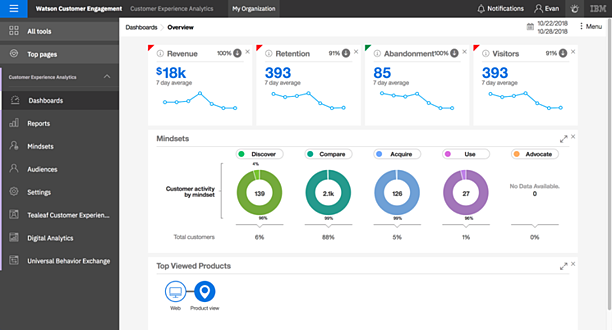 A set of Journey Analytic reporting capabilities come with the new cloud based IBM Customer Experience Analytic Solution. By integrating other elements of your marketing technology infrastructure you can expand on those reporting capabilities. The fully integrated solution is not available yet, but fortunately there are some very clear actions you can take now that will start delivering value right away. Read and watch the IBM Customer Experience Analytic product material at the following link. 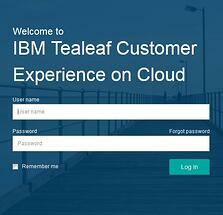 Implement Tealeaf CX on Cloud now, this will enable you to start identifying the customer experience issues on your current web and mobile properties. Universal Business Exchange (i.e. UBX) is then available at no additional charge. You can begin adding endpoints based on your marketing technology portfolio, this will enable you to start building a data model for tracking customer journeys. 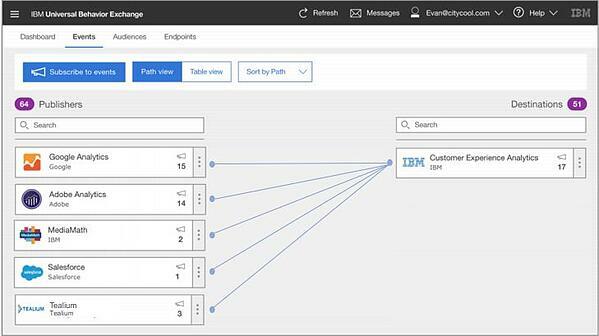 If you would like additional information on the IBM Customer Experience Analytic announcement and assistance in helping your company build a roadmap to take advantage of these capabilities, then please click on the tile below.